The World's Most Popular Liquor Becomes Scarce On Many Shelves : The Two-Way At 106 proof, China's famous Moutai baijiu liquor is getting hard to find, as bottles are being snatched up by speculators. Its brand parent recently became the world's most valuable distiller. 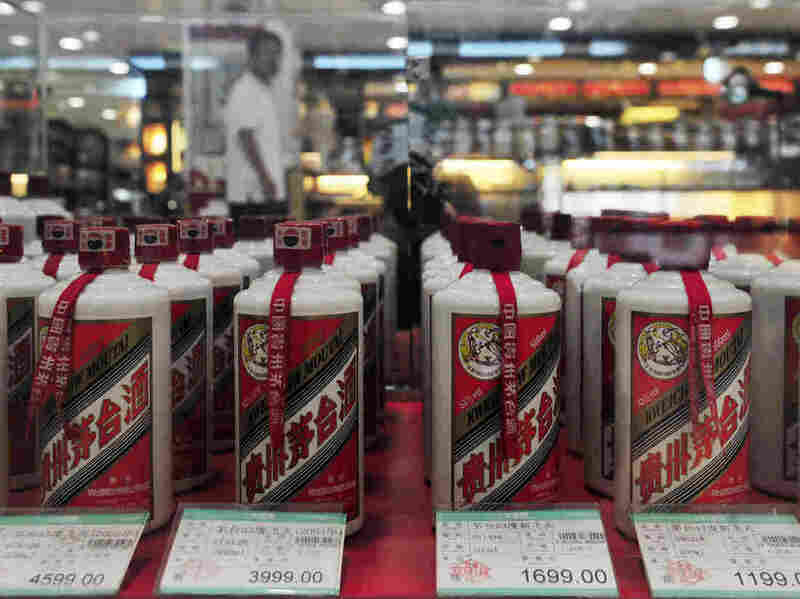 Bottles of Moutai baijiu liquor, seen here in a 2012 photo, have become scarce in many Chinese stores, even as spirits maker Kweichow Moutai has seen its stock soar in the past year. Moutai baijiu reigns as China's favorite brand of its favorite liquor — but the famously fiery drink is getting hard to find, as bottles are snatched up by market speculators. Renewed thirst for baijiu has sent the value of brand parent Kweichow Moutai soaring, making it the world's most valuable distiller. The gains have come as Moutai baijiu rebounded from a decline in popularity that's been widely blamed on China's crackdown on corruption. With a luxury cachet and 106-proof rating, the liquor has long been a mainstay at banquet dinners — and a special gift for anyone hoping to curry favor. Baijiu can be made in a number of ways, but the state-owned Kweichow Moutai's version is by far the most famous. Based in the namesake town of Maotai, in Guizhou province, the spirits-maker uses traditional labor-intensive methods and distills and ferments its liquor multiple times (seven, or even more for some varieties) before aging it. Those practices are another reason for Moutai baijiu's rarity and price. As Bloomberg News reports, "The grain and water used to make it must come from Maotai town, and the brew must be buried in urns for at least four years before it's sold." A 375-milliliter bottle of the flagship Feitian (Flying Fairy) Moutai baijiu is currently listed at more than $160 on the Baijiu America website. But there's been a run on the liquor, at least in part because Chinese businesses and investors see it as a hedge against inflation, as the South China Morning Post reported last spring. At that time, a recent vintage of the aged liquor could fetch more than $300, the paper said. It added that many buyers were also betting the spirit would recover when President Xi Jinping's anti-graft campaign ended. Those factors have made for heady days at Kweichow Moutai Co., which last year saw its market capitalization shoot past spirits giant Diageo. And after the distiller announced in recent weeks that it would raise the price of its Flying Fairy brand by nearly 20 percent, the company surpassed LVMH Moet Hennessy Louis Vuitton on Bloomberg's index of global luxury goods. Before China's corruption campaign took its toll, as NPR reported in 2013, Moutai baijiu's price had inflated dramatically, from around $30 in 2003 to the hundreds and thousands of dollars one decade later. In 2012, a 1980 vintage was auctioned off for $1.3 million. Made from sorghum and wheat, Moutai baijiu is a clear spirit that has been served to at least two U.S. presidents — Richard Nixon in 1972 and Barack Obama in 2013. Here's how one retailer describes it: "Crystal clear with a floral nose, notes of miso with hints of ginko nuts and burnt rice. Silky palate with hints of spiciness, dry yet smooth finish." Visitors to Maotai have noted the town's smell of roasting sorghum; Bloomberg says the aroma is "soy-sauce-like." The mountainous area is also known as a wine region, with a river that has benefited from environmental protections. It's also famous for being where Mao Zedong's Red Army took refuge during the historic Long March, using spirits from the town for (among other things) its medicinal effects, such as disinfecting wounds. "Alexander Haig had sampled the drink on an advance visit and cabled a warning that 'Under no repeat no circumstances should the President actually drink from his glass in response to banquet toasts.' Nixon ignored the advice and matched his host drink for drink, shuddering but saying nothing each time he took a sip. Dan Rather said it tasted like 'liquid razor blades.' "
After he was told about the liquor's salutary effects on the Red Army's soldiers, Nixon reportedly said, "Let me make a toast with this panacea."